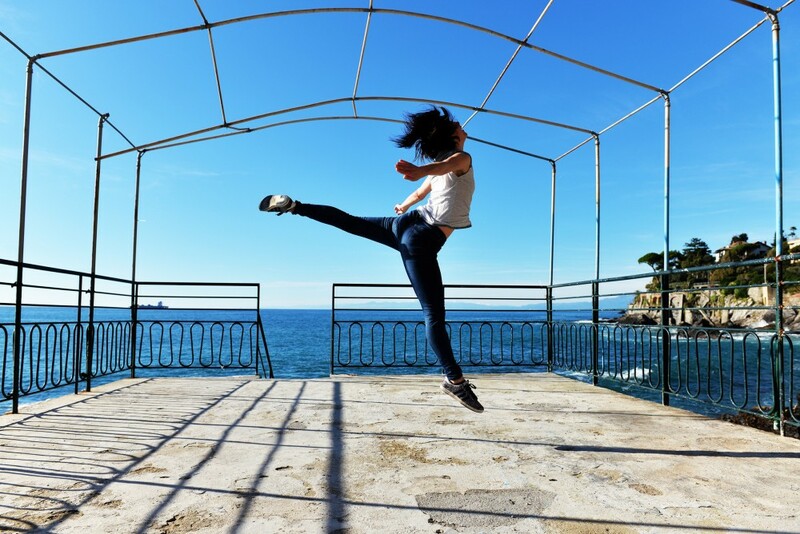 SAUTE(ING) INTO MAINE: New York based modern choreographer and Visiting Artist Laura Peterson dancing during her fellowship in Italy. This year at Bowdoin, Peterson will teach the Department of Theater and Dance’s modern dance students. During her time at Bowdoin, she hopes to implement interdisciplinary projects with the Department of Visual Arts and share the serious and artistic nature of modern dance with the Bowdoin community. After Assistant Professor of Dance Charlotte Griffin’s unexpected departure from the College this summer, the Department of Theater and Dance hired New York choreographer and now Visiting Artist Laura Peterson to teach advanced modern dance students and bring an interdisciplinary eye to projects in the department. According to Chair of the Theater and Dance Department Paul Sarvis, Griffin left Bowdoin for a job at the University of California, Irvine, where she will conduct research and teach classes. Speaking on behalf of Griffin, Sarvis said that Irvine’s proximity to Los Angeles pushed Griffin to leave Bowdoin this past summer. Peterson, who was hired during an informal search for a one-year visiting artist, met the dance department’s criteria of excellent artistic work, a terminal degree, intellectual engagement, a strong teaching record, and a willingness to live in Maine. A formal search to permanently replace Griffin will take place this school year. “What we wanted to do because of Charlotte’s absence is generate some excitement and get a cutting-edge New York choreographer to come and teach,” Sarvis said. In particular, Sarvis noted Peterson’s commitment to the disciplines of dance, sustainability, architecture and the visual arts. During her time at Bowdoin, Peterson hopes to collaborate with the Department of Visual Arts. Sarvis said that the department was looking forward to potential collaborations with the visual arts department. “We are particularly excited by her engagement with visual art...we’re really enjoying the company of our visual arts colleagues, we thought that would be, especially, kind of piquant syngery,” he said. Peterson also said she was excited to work with students who have a wide range of academic interests, as she had previously only taught undergraduate students in Bachelor of Fine Arts programs, where students tend to only study dance. “[The students] just have a wide variety of ideas and interests and it can really make a classroom vibrant in a different way,” she said. In her classes, Peterson wants to teach contemporary dance as it relates to contemporary issues and how dance is related to other art forms. In her technique class specifically, she wants her dancers to fully comprehend what it means to be aware of their bodies, the music and the space they’re using. Peterson will also choreograph an audition-based piece set on Bowdoin dancers for the December Dance Concert. Peterson also said that the ability to choreograph for a small group is unique for a dance program. “I’m just going to try to make the dance for the people right there and stay true to whatever concept is arising through our process,” she said. For the rest of the Bowdoin community, Peterson hopes to portray contemporary dance as a serious intellectual pursuit.